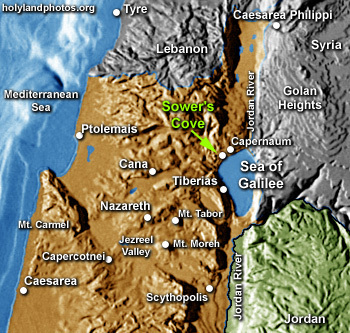 The "Sower's Cove" is located 0.6 mi. [1 km.] west of Capernaum on the north shore of the Sea of Galilee. It is a horseshoe-shaped cove, that looks somewhat like a natural semicircular theater. Many have suggested that it may have been the place where Jesus, being pressed on by the crowd, got into a boat, and from near the shore, preached to the assembled crowd (see Matthew 13:1�; Mark 4:1�; and Luke 8:4� - especially, the parable of the Sower).